'WWE NXT Takeover: Redemption' review: Bringing the darkness to the front page – AiPT! If there is one character in professional wrestling that transcends the disbelief and maintains his supernatural mystique even now, it has to be The Undertaker. For a man who once crucified an opponent, buried another alive, locked others in coffins, fought and bled making Hell in a Cell what it is, and even entombed his manager in cement of his own volition, Undertaker is a beloved legend of the wrestling business. There were none truly like him before and none since. Until Aleister Black, that is. Now, the darkness has a successor and, in some ways, he is even more terrifying. Often, BOOM! Studios’ WWE comics offerings tell multiple stories, keeping kayfabe alive in the 21st century. In WWE NXT Takeover: Redemption, they do away with the format, focusing the entire issue on perhaps the most intimidating man on the NXT roster: the mixed martial artist from Amsterdam, Aleister Black. Speaking of kayfabe, I really want to believe that Black lived in some abandoned warehouse in Amsterdam, wearing nothing but his wrestling gear, surrounded by candles, waiting for a fight to come along. Invited to NXT by commissioner William Regal, Black arrives looking for competition and nothing else. He is a Mortal Kombat character made flesh. The comic covers Black’s major feuds, including his phenomenal debut against the charismatic Velveteen Dream, which put both of them on the map. Following his defeat of Dream, Black took on then NXT Champion Andrade Cien Almas and his dastardly manager, Zelina Vega, eventually winning the title. Shortly thereafter, however, Black lost the title to everyone’s least favorite bearded madman, Tomasso Ciampa, thanks to interference from Ciampa’s former friend, Johnny Gargano. Over SummerSlam weekend, the triple threat between the three was meant to bring the feuds together, but a late injury to Black changed the plans. 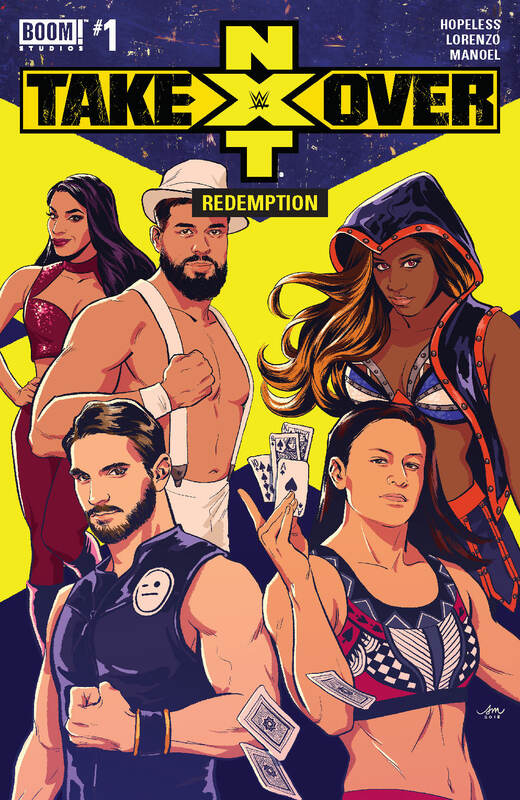 Wait, is this the comic or the actual NXT? Both? Writer Dennis Hopeless is doing a fantastic job turning the on-camera happenings of NXT into functional stories on the comic page that turn people we know to be athletic actors playing parts into vicious sociopaths or beloved heroes. Hopeless gets the concept of kayfabe and WWE’s writers should be paying attention. If I knew nothing about Black and you handed me this comic, he’d be over with me immediately. Of course, in comics, the art is partner with the story, and artist Rodrigo Lorenzo is a suitable partner. While some of his face work is forgettable, he has done an excellent job taking the real life matches and turning them into a seamless story of one man’s quest for competition. His portrayal of Johnny Wrestling getting his face kicked in by Aleister’s finisher, the Black Mass, particularly stands out. While I do enjoy what the different artists have brought to the comic, having a set team might be a way to move this particular comic from developmental to the main roster, so to speak. For NXT and WWE fans, this one is a must buy. When the darkness returns, whether it be on NXT, Raw, or SmackDown, be ready for a man who is not truly good, nor truly evil. Beware the devil on his back. Beware the rage bubbling beneath his calm persona. Beware Aleister Black. Now, the Undertaker has a successor and, in some ways, he is even more terrifying. For NXT and WWE fans, the tale of Aleister Black is a must buy.